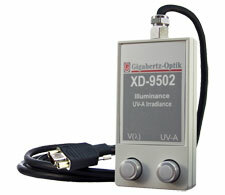 XD-95 2-sensor detectors are designed for use with Gigahertz-Optik's multi-channel X1 and X9 hand-held optometers. The ability to measure two wavelength ranges without having to change the detector head and relocate it for measurement greatly simplifies the measurement procedure. The detectors are supplied with a 2m long coaxial cable with -4 type connector for use with Gigahertz-Optik's range of optometers. Internationally traceable calibration & certification of illuminance in lux and UV irradiance in Wm� and W/cm� within the specified spectral sensitivity range is provided. Liquid Penetrant Testing of surface defects using the dye penetration process (DIN EN 1956, ASTM and MIL Standards) and Photostability testing of drug and drug products as stated in ICH guidelines (International Conference for Harmonization) requires the intensity or XD-9502: UV-A Irradiance & V(λ) Illuminance dose control of the light sources used for test sample irradiation. All optical radiation detectors are calibrated and certified by Gigahertz-Optik's calibration laboratory with both absolute sensitivity data and spectral responsivity plot provided.